By the end of this month, which is very soon, Romantic Antihero will have been in operation for an entire year. I get all kinds of neat information from WordPress about how people are using my site. Cool stuff like what search terms they were using when they ran across RA, or the link they clicked on to come here, or the links they clicked on while they were here. Sometimes I’ve been surprised by these things, where references to RA end up, and all that. I will tell you now that people have a tendency to google themselves, so if you’re going to write about someone don’t be surprised if they end up emailing you or commenting on your blog! Anyway, what prompted this post was the looming one year anniversary date, and also yesterday RA broke the 500 posts in a month barrier, and that got me jazzed a little bit. I’m not doing this website to collect hits or looking to become a player in the blogosphere (whatever that means), but I do like the idea that I’m writing about stuff that’s interesting enough for people to be actively searching for it. Because I write about my life, and I want my life to be interesting. 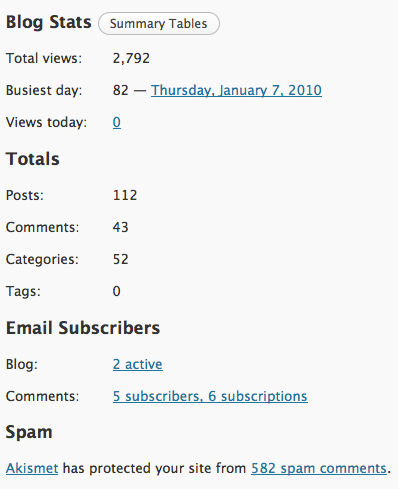 I know there are lots of blogs that get lots more hits, but like I said, I’m not in this for the page view count. To me this is a project, and a long term project at that. Having staying power in this project, keeping it current and updated with the type of stuff in my mission statement (Budo, the Heathen Gods and Right Living™), that’s important to me, even if nobody ever did read it. It’s just cool that they do.